If you find yourself attending PAX West, East, South, Aus or Dev, then one of the things that you will notice is the warm welcome. Conventions, be they for yarn, drugs, lawyers, etc., tend to leave the attendees feeling wiped out after a few hours. When I was younger, I definitely had better staying power, but the other lingering feeling was this weird sense of being an outsider. Too often though, you have this sense that by walking through the doors then you have become part of this quasi-world that exists for people with a unique obsession, perhaps an unusual world view. That can be strange enough. Then, you realize how many people actually attended and start noticing that they have broken down into smaller groups. There are the top tier sellers. Those are the aloof people judging the rest of us. Look at the ones who know how to purl sitting in their circle. At PAX, they flew their freak flag proudly. Many spoke about how online interactions had reassured them that they were not the only people in the world who liked what they liked. Hugging occurred. Nowadays, popular culture has made it a lot more difficult to say that you can’t find anyone else that likes what you like. People know who Deadpool is, for crying out loud. I could make a side-comment here about a wizard school and no one would look askance. Be all that as it may, a significant difference remains. We all spend a lot of our day thinking. Some of that thought is shallow and some of it can get down to the minutiae- you know- I want pasta as opposed to I want a nice orecchiette with cherry tomatoes, arugula, olive oil and hints of black pepper and garlic. Excuse me while I eat something. Never living inside someone else’s head, I will never know if I obsess over things more than anyone else. My limited experience of semiotics suggests that some people do obsess about details more than me. Yet, I like that world. I enjoy thinking hard about art and culture. But I’ve never been entirely at home at the conventions. At some point, my patience discussing this one part of my life runs its course. It’s not that I don’t think there is much to be considered in the writing of Robert Sheckley or all the episodes of Buffy or saving ancient COBOL programs or…, but that there is so much more out there in life. 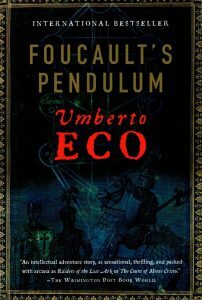 Umberto Eco seemed like a wanderer, also. He wrote beautifully about packing awkward items for travel, his experience of student protests, and about conspiracy theories. Breaking through to popularity with The Name of the Rose, he even became a subject of reference himself. Before Oliver Stone and the internet made it commonplace to be curious about weird stuff- essentially letting your mind go where it wants- Umberto Eco showed me that it was okay to wonder about stuff. You could be just a little or a whole lot weird and still go out in public and behave yourself. You’ve Got to Check This Out is a blog series about music, words, and all sorts of artistic matters. It started with an explanation. 88 more to go.